Former Labour Whip Fiona Onasanya outside the Old Bailey in London on Tuesday. Image: Jonathan Brady/PA Wire. Labour’s Stephen Kinnock has said that Fiona Onasanya, a Labour MP who was jailed for lying about a speeding charge, should resign and that the party will force a by-election if she does not. Ms Onasnya was jailed for three months on Tuesday after she was found guilty of lying to police over a speeding charge, but she is appealing against her conviction. Mr Kinnock told talkRADIO’s Julia Hartley-Brewer: “I think there will be a petition to recall – 10% of her electorate need to sign up to that. “It seems to me that we will achieve that number and that will force a by-election. In the by-election Labour will win. “I am afraid Fiona will no longer be a member of Parliament. It is a pity that it has got to this. “I think it is awful for her personally and I am sure it has been a really tough time for her but she should resign. Under laws introduced in 2015 any prison term leads to a recall petition, which will be open for six weeks and can force a by-election if signed by 10% of voters in a constituency. However, this may not happen for several months because she is appealing. Parliamentary rules only require the removal of an MP who is jailed for 12 months or more. 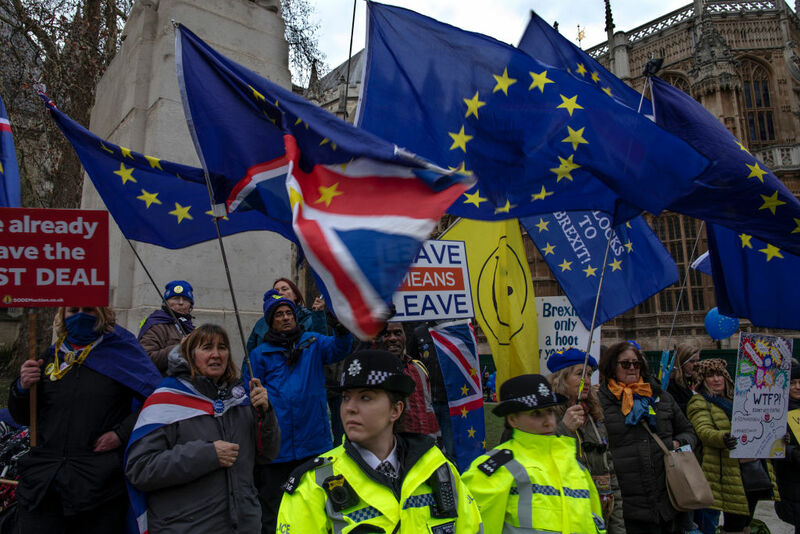 Protesters for and against Brexit outside Houses of Parliament on Tuesday, as MPs debated the seven amendments on the Brexit legislation. When asked about the Brexit vote on Tuesday night, Mr Kinnock described the Government-backed Brady amendment as a “farce”. The amendment to replace the backstop on the Northern Irish border with “alternative arrangements” was passed with a majority of 16 votes. The MP for Aberavon said: “It is yet another unicorn in the Brexit fantasy forest. The Brady amendment is a farce because the EU has said that the Withdrawal Agreement is locked down. “They are not going to reopen it and the backstop is a very important part of the Withdrawal Agreement so it is not going to happen. “What we will have is another two weeks of humiliation of our Prime Minister going off to Brussels cap in hand, trying to get something countless times she has been told she is not going to get. “She will come back to Parliament on February 13 empty-handed and we will be back to square one.